We arrived in the evening into a Bangkok in the middle of a constitutional crisis, and rapidly retreated from a political meeting near our hotel: banners and LOUD-speakers. But the morning was quiet, and we had a quick wander over the river to Wat Arun, where the official pagoda cats wear little jackets. Going from Bangkok to Mandalay took less than 2 hours in the plane but was like going back 40 years: rough empty roads with almost no private cars, lorries belching black exhaust, whole families riding on motorbikes, and bars in huts draped with huge adverts for local whiskey. And all the signs saying “Warmly welcome and take care of tourists”, which everyone did: for the whole trip we only met friendly and helpful people. In fact there were about 8 of them to see us off in the taxi from the airport to Pyin-Oo-Lyin – what used to be called Maymyo, the hill station that the Brits used to retire to when the plains got too hot. There we cycled past crumbling colonial piles, were shown round the old garrison churches with great pride and kindness, with broken gravestones of forgotten young men and women. The wonderful Botanic Gardens, started in 1917, were close to our hotel - they are in fine condition, full of women sweeping the grass, but it was disappointing to find they are owned by the arch crony of the military, Tay Za. 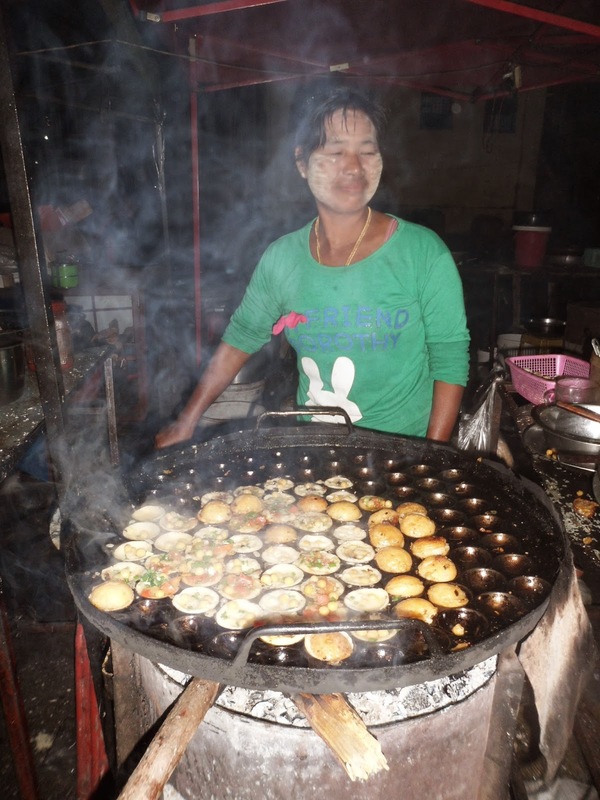 The night market was wonderful - small stalls selling little puff balls filled with tasty veg, dozens cooked at once in a large circular contraption with indentations like an egg carton. We took an auto-rickshaw to the local waterfall - the video below shows how the pick-ups are loaded high with produce and passengers. Just travelling along the road is an experience. But the big adventure came in the morning when we joined the mob trying to buy tickets for the one train of the day to Hsipaw, over the legendary Gokteik viaduct. This is a major pilgrimage for all rail enthusiasts: they could easily be spotted with their jackets full of pockets for bits of camera, guides etc, and the grudging accompanying partner. After a bit of elbowing (literally) we got our hand-written chits for First Class - the less forceful ended up in hard class, and as we knew what the journey was going to be like we wanted all the padding we could get. The train was late, of course, but was busily photographed as if it were a celebrity on a red carpet. As it waited a further 30 minutes in the station, the local children simply walked through it on their way to school. Pyin-oo-Lyin (Maymyo) station in the early morning - the place is well-known for its continued use of horse-drawn taxis. The timetable - one train each way, each day. Note 1 hour 35 minute wait at Pyin Oo Lwin for the down train to Mandalay (but it will never be on time). We rattled off at around 20 miles per hour, rocking (sometimes violently) along a track that was neither level nor parallel. There was nobody selling on the train, but we stopped at every station for about 15 minutes while everyone got out and bought hard-boiled quail eggs, rice in banana leaves and indescribable things on sticks. Then I carried on nostalgically comparing past train trips with other buffs, who by some strange coincidence all seemed to be late-middle-aged men. As we got closer to the viaduct the keen photographers started positioning themselves, and when we wound down to the edge of the gorge even the cynical started wowing at the beautiful structure - children put down their Ipads and Kate actually stopped knitting, which is s sure sign that things had got impressive. We crept over leaning out of the windows to look down the gorge. It was made in 1899 in Pennsylvania, and then shipped out and put together, like some absurd Meccano product, for the British railway – maybe they used US contractors because of their experience on buiding trestle viaduct - Paul Theroux features it in The Great Railway Bazaar, when foreigners were forbidden to cross it. I had read somewhere that it creaked and groaned as the train went over, but sadly it was silent that day. Many people had private guides and they got out at the next station to carry on in cars, but we stuck it out like troopers, gently rolling on to Hsipaw in the afternoon sunshine past paddy fields and temples, and the men with flags whose job was to wave the two trains a day through road junctions. It took around 6 hours for 80 miles, even slower than Barnstaple to Exeter, but a wonderful journey. It’s rumoured the railways are going to be restored with Japanese help – rather ironic given their previous work on a certain railway to Burma. But don’t mention the war. Hsipaw is wonderfully ramshackle and friendly place which is starting to attract more tourists - we managed to book our room at ‘Lily the Home’ through Agoda and were overjoyed to see our name on a board, and they had wifi and cold beer. We had been sceptical about reports that a relative of the last Sawbwa of Hsipaw was still living in the old ‘Palace’ and even welcomed visitors, but were assured this was true. So we walked through the gates, past overgrown tennis courts, to the house. The last Sawbwa, Sao Kya Seng, went to the US to train as a mining engineer, and there met and married an Austrian, Inge Eberhard. Her story is told in Twilight over Burma , where she describes her life in the fairly medieval post-war Shan states. Sadly he was killed in the military coup in 1962, and she escaped Burma soon after - see this article. Donald (the Sawbwa's nephew) is still alive and living in the house in reduced circumstances, to put it mildly, and his son showed us round. On the walk home I bought Twilight over Burma from the stall run by “Mr Book”, and that evening we ate at “Mr Food”, where we greeted the Sawbwa great-nephew as he ate his noodles. The Shan Palace in Hsipaw - it's seen better days, but an extraordinary place. Lily the Home set us up with an excellent guide, Mitch, for 3 days walking in the hills. Just us and a charming Belgian, we set off walking out of the Shan valley, crossing the path of the new pipeline carrying oil and gas from the Indian Ocean to China ("Severe punishment on pipeline destruction"). By lunchtime we stopped at a Palaung village, Pankam (a standard trek from Hsipaw): fortunately Mitch was Palaung and so he could not only speak the language (as well as English, Burmese, Chinese, Shan and some Thai), but could explain what was going on. 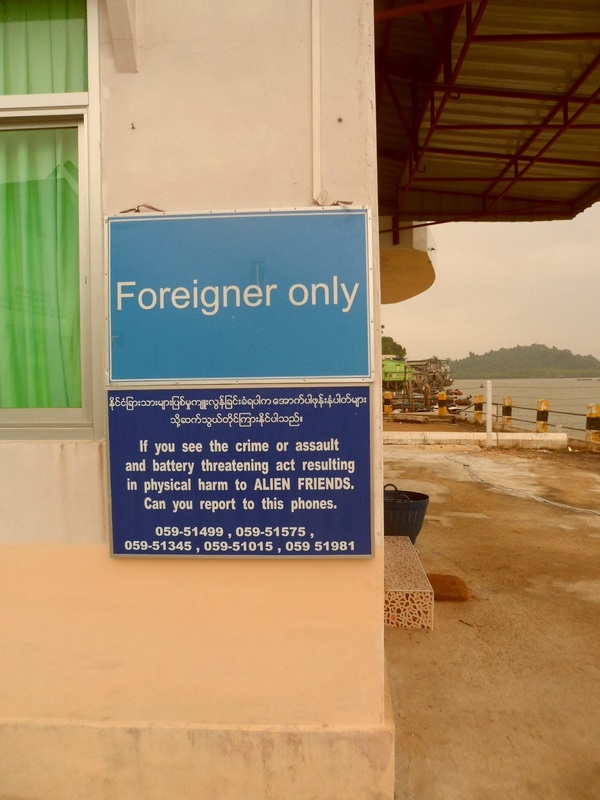 This is an area where they welcome the change of name to Myanmar, as 'Burma' identifies the country too much with the Burmese, who only make up two-thirds of the population. So we learned to stop calling it Burma. We went round both the pagodas and monasteries, where small monks were chanting at each other at great volume, and also to the spirit houses where fertility symbols were nurtured. This is the traditional Burmese combination of Buddhism and nat-worship: they seem to rub along well enough together. Mitch also explained that the big festivity comprised a whole village going on a pilgrimage to another village, where they were accommodated in huge huts next to the pagoda. In the evening Mitch would simply go to a large house and ask to be fed and put up: the family would move out of their large common bedroom upstairs and we would move in, sleeping on mats with a good supply of blankets (sometimes with some of the family there as well): this was also the shrine room, and so we felt very blessed as we bedded down. The whole extended family were arranged downstairs on mats, and my main fear was having to get up in the night to go to the lav, which kept the beer consumption down. The food was wonderful, and the second night we ended up sitting round doing tricks for the family, bouncing children on knees and so on until late. They were charming, friendly, and laughed at our feeble attempts at Palaung pleasantries: tricky as even the word for ‘thank you’ changed from village to village. Each big house lit a fire outside their front door, which was kept going all day and family and guests sat around it to gossip. The Shan in the valleys grow rice, and the Palaung in the hills grow tea. This means the hills are fairly deforested, with scattered tea trees rather than the neat rows of bushes in India. After picking the tea, the leaves are dampened and crushed in huge vats under stones, and then the black leaves are laid out on the street to dry - our hostess did this in the morning. And then it is sorted with calm efficiency by a gang of women, who never stop talking for a moment. The Palaung State Liberation Front / Ta'ang National Liberation Army (PSLF/TNLA) is fighting the Burmese as part of the 65-year civil war that’s been going on since independence. The PSLF have been laying landmines against the Burmese army, and so part of the area we wanted to go to, Namhsan, is now off-limits to tourists. Just a month before there were a couple of casualties near Kyaukme, the next town to Hsipaw, but we were assured we were safe. We got introduced to a wonderful nun, around 70, who talked continuously and laughed about how all her teeth had fallen out. Kate thought she was the happiest person we had ever met. Then we walked down into the valley again to civilization. These local home-stays are an extraordinary privilege, and although we saw a few other small groups being guided around, everybody found their own place to stay. I hope the simple hospitality does not change as this area gets increasingly popular. The next morning we were up at 4 to visit the main market, which takes place in pitch dark and finishes by 6 – candle-lit stalls selling huge fish from who-knows-where. Then we got front seats in the air-con 05.30 bus to Mandalay - all very efficient and helpful. Mandalay sounds very exotic, but it is rather a dump, having been flattened in WW2 and shabbily rebuilt afterwards. But we had an exhilarating motorcycle taxi ride to our hotel, and then took the standard sunset shots over the Irrawaddy followed by an enjoyable long walk in the dark, trying to avoid the numerous gaping holes in the pavement. We then had to get to Kawthaung at the very bottom tip of Burma for our boat trip, and rather than trusting the internal flights we had booked to fly to Bangkok and then transfer immediately to the Southern Bus Station, a massive modern edifice full of shops and restaurants, as everywhere in Bangkok seems to be. Dozens of ticket windows as each destination was served by multiple companies. We were supposed to get a night bus to Ranong, which is a couple of miles by boat from Kawthaung. Amazingly it all worked, we found the right window and were given tickets for the bus seats we had booked months before, sitting on the sofa in Cambridge. I can never quite believe this will happen. And the VIP bus was great: seats folding right down, plenty of leg-room, air-con not too cold, no TV, and a 15-minute stop for free, and very good, food in the middle of night. After leaving my jacket and our hats on the bus, lost forever, we got to the dock at Ranong where there is a minor industry ferrying crowds of westerners to Burma for an hour so they can renew their visas for Thailand, and add to foreign exchange for Burma. These visa-runs typically involve some small and very unsafe ferries across the choppy estuary, and I had kittens as some small lad hung over the side with our passports in his hand. 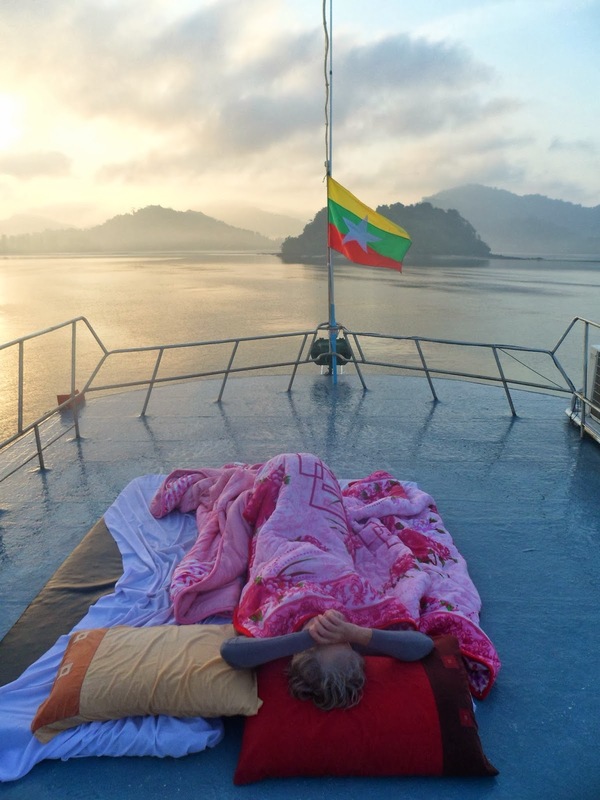 But we were warmly welcomed back into Burma, and got shown round our boat. Burmese sign English can be wonderful - near here were some new public toilets labelled 'Lady' and 'Gentle'. And it really was our boat, as we found we were the only customers: 5 days with a crew of 5 to look after our every whim. They said it was our honeymoon voyage, which was apt as we had never had one. Sea gypsies fishing for squid in front of our boat, just to ourselves. We set off into the archipelago, and visited our first of many empty islands, Taing La Bo: white sand, empty beaches, clear warm sea, thick jungle, and occasional bits of washed-up plastic rubbish. Anyway, apart from the last bit, it was rather absurdly paradisical (sp?). 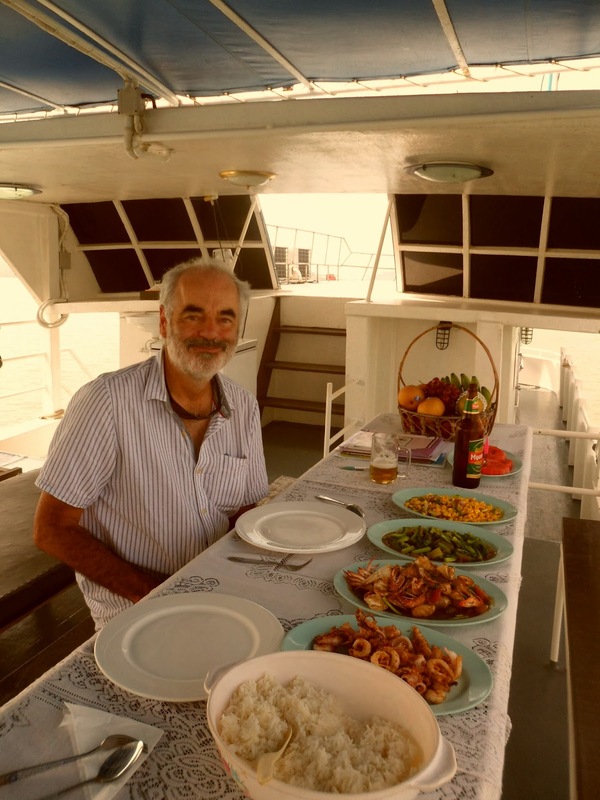 We had a crate of cold beer, and the cook went rather mad with four large dishes and rice at each meal: we felt guilty leaving any and tried to eat the lot, until Kate saw that the crew finished it all off afterwards and so we were relieved we could leave some. In the evening we could watch the boats with their strong lights strung out to attract squid; gradually the lights at the ends are extinguished, bringing the squid to the middle where a net lifts them in. The snorkeling was good – quite a lot of live coral although most of the antler variety was shattered, not helped by past (and now banned) dynamite fishing. Lots of the usual tropical fish, some small black-tip sharks but generally nothing too big or daunting. On Lampi National Park we took sit-on canoes into the mangroves - we were told that the crocodiles were Ok but if we saw elephants we should scarper (we saw neither). Apparently the elephants were released on the huge uninhabited island when they were no longer used in construction, and they don't like visitors. The mangroves were quiet, smelly, fascinating and a bit eerie. Paddling through the mangroves. Spookily quiet. We had a choice of air-conditioned cabins, but instead chose to sleep outside each night on the roof – the crew helped us do anything we wanted, although we mainly just went along with their suggestions of places to go. It all felt rather unreal. We had heard about the sea gypsies, or Moken, who traditionally are born, live and die on their boats, just coming ashore for fresh water and fruit from trees they plant. 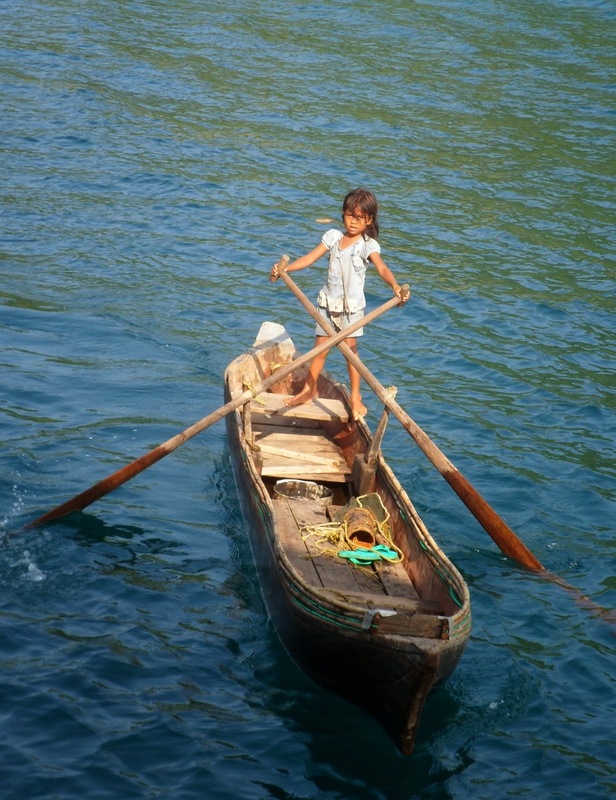 We met a family, 7 of them on the main boat and then small hollowed-out log boats that they row standing-up, facing forward – the little kids were amazingly skillful. Our crew gave them some food, and we had some bits of the kids. 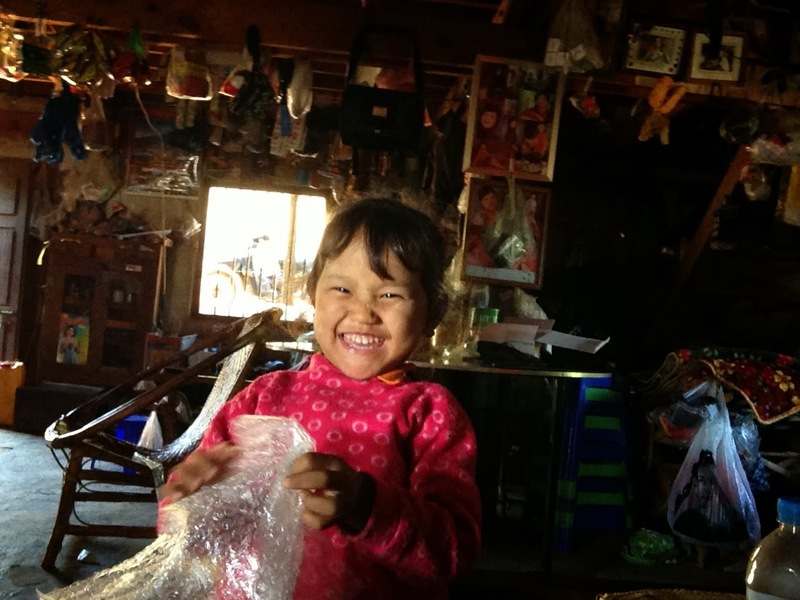 Normally I dislike doling out stuff to local children, but we took the lead from the crew and it seemed fine. We had also read that the government was trying to get them to settle into villages, and at first it seems a shame to stop their traditional way of life. But after seeing the kids, without apparently any access to education or anything else – real gypsies – I was not so sure it was such a bad idea. The crew offered to take us to a newish village strung out along a beach, and so we went ashore equipped with balloons, hair-ties and other cheap bits from Kawthaung market. These went down a treat, and the children solemnly walked around clutching their balloons, followed by inevitable bangs and forlorn wails. We went to the head-man’s hut which acted as the village hall, incongruously complete with two huge dilapidated snooker tables. He was very welcoming and chatty – proud of his pigs in the yard and the large rubber plantation that was started on the hillsides behind the village. The islands around are all being taken over by companies who are putting up resorts and stopping others landing, but there is also some investment coming into the village and it did not seem too sad: the local developer is Mokan International, who claim to be "protecting the Myeik Archipelage through sustainable development", and are part of a Scandinavian company who sound as if they are trying to do things properly. But the village did have around 5 bars – Moken men can be heavy drinkers. There were a group of large fishing boats moored together in the bay and we went over with the crew to buy some fish. It was dark, but the decks were full of an apparent chaos of nets, floats and crew milling around doing stuff. All under very bright lights, so it seemed like a huge dramatic performance. Genuinely awesome, and we were made to feel very welcome. Came back with a bucket of massive prawns. After 4 nights away, with no phone or internet signal, coming back into harbour was a bit of a shock. We thanked our crew, especially our trusty captain, proud and dignified in his cabin with his bed and his shrine. Then the long slog home began, starting with a flight to Bangkok and a nasty taxi driver who could not find our hotel in spite of us having a map all ready, in Thai, knowing that Bangkok taxi drivers don’t know the city at all. Maybe he could not read very well, but he got grumpy with us and drove aggressively, and then tried to over-charge. We spurned his demands. But the fact that this was the one, solitary unpleasantness of the whole complicated trip only emphasises what a wonderful and extraordinary country Burma is.